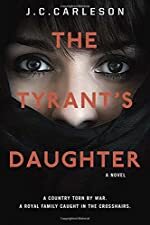 The Tyrant's Daughter by J. C. Carleson. Review: Are you interested the Middle East and conflict? Then The TyrantÕs Daughter by J.C. Carleson is the book for you. The main character in the book is Laila. Laila lives like royalty until the day her father dies when sheÊmoves to America and everything changes. In her home country, her father had run the country, but when she, her mother and her little brother Batsien moved to America she hasnothing. Laila eventually meets friends and her life gets better. These men visit her house and then her mother starts getting gifts and money. Then she hears about these poor people who are supplying money for them. She knows she has to stop this plot before it is to late. She also meets a guy and wonders if he is right for her. Will Laila stops her mothers plan in time? Will she get the guy that she likes? The TyrantÕs Daughter is a book that boys and girls ages 10-12 will enjoy. The book has some high level words. Boys may not be as interested in all the romance, however a girl might enjoy this element. The plot has elements of war, action, mystery, and romance. The storyline is good because you can see how the main character is feeling throughout the story. Some parts of the story are a little hard to understand. The TyrantÕs Daughter has a complex plot, and sometimes the events arenÕt always clear. The characters however are easy to understand, and their motives are clear. The TyrantÕs Daughter also gives insight into a world that is foreign to so many Americans. It is a good choice for a thought provoking novel. We would like to thank Random House for providing a copy of The Tyrant's Daughter for this review. Have you read The Tyrant's Daughter? How would you rate it?